Over the years, you may notice that the amount of clutter and possessions that you accumulate seem to be growing right along with your family. People cycle through different hobbies, children’s toys take over common spaces, or contents of the home office that is set up in the den might be somehow making their way into the kitchen. Moving to a larger home or adding on to your existing one can be expensive and tedious – unless you are adding a space to your backyard. With a little bit of imagination, a storage shed can be the budget-friendly addition of your dreams. Here are four fun ways to utilize an outdoor storage building. Arts and crafts are soothing pastimes that often yield beautiful finished products. Unfortunately, supplies like paints and brushes, wood, paper, beads, and yarn can easily make your house feel chaotic and cluttered. Add some shelving, baskets, or cabinets to a storage shed and you’ll have a great new place to keep your materials organized. Best of all, you can also move your favorite knitting chair or easel by one of the shed’s windows and let this little building double as a peaceful studio. 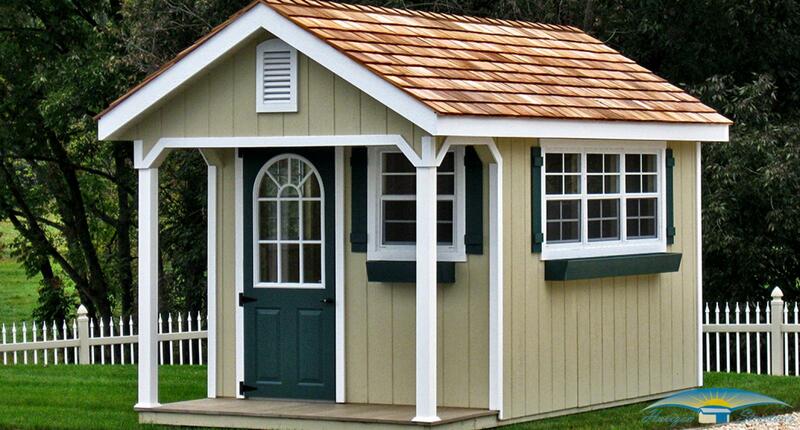 Similarly, a storage shed makes a great place to set up a home office. For those who work from home, one of the biggest challenges they face is separating their work tasks from home life and chores. By placing the “office” in the backyard, you can easily sidestep this problem and have a bright, quiet place where you can easily focus on getting down to business. Of course, storage sheds can be used for entertainment purposes too. If your house is on the smaller side, a storage building can help you make the most of your yard when you have company. Add cozy seating, festive lanterns, and other decorations of your choosing to transform it into a lounge or pub that will be the highlight of summer gatherings or a relaxing place to retreat with friends after work. Texas storage sheds make great places to go if weather is not ideal; you are technically out of the house, but still can remain on your property. If you are a parent, your storage shed pub becomes a childproof adult space since you can securely lock it once you are done. On the other hand, if your children’s toys are taking over your home, a storage shed can make a fabulous play cottage. Add fun touches like children’s furniture and a toy kitchen for hours of fun and imagination. Install shelving or cabinets, or have your children help you pick out storage bins for excess toys as a part of the design. Some parents even discover that their homes stay in better order when the toys in the play cottage are rotated with toys in the main house. This makes the toys seem like they are new again, and therefore they capture children’s attention for longer periods of time. No matter how you set up the play cottage, children young and old alike will appreciate the wonderful feeling of independence they will have when this space as their own little world. Whether you choose to use your storage building as a space to work or create, or to play or relax, the outside can be as customized as the inside. Storage sheds can be matched to the exterior of your home, so your backyard addition should have no problem meeting specific neighborhood regulations. An easy and budget-friendly option, a storage shed can help you make the most of your space and live your best life. PreviousPrevious post: Why not start planning now?